For what is likely the first time in history, an award for the most heroic dog in America has gone to a cat - and it's totally deserved. 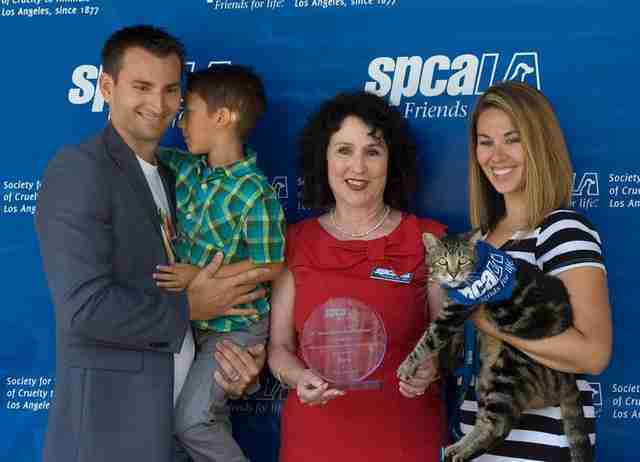 Tara the cat made headlines last year for saving her 6-year-old human from an aggressive dog, and last week the Los Angeles SPCA named her their "Hero Dog" of the year. Jeremy Triantafilo was riding his bike in front of his family's home in Bakersfield, California, in May 2014 when a neighbor's dog, Scrappy, suddenly attacked him. Tara, sensing danger for her little human, ran full speed into Scrappy, body-slamming him and scaring him away. A home security camera caught the entire frightening episode on video. 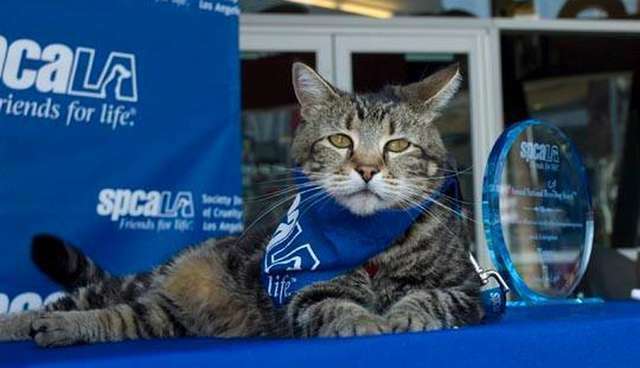 Earlier this week, more than a year after her lifesaving actions, the 7-year-old tabby was honored with the Los Angeles SPCA's 33rd annual Hero Dog award. Tara, along with her human family, showed up to accept the award - along with a year's supply of pet food. "We were so impressed by Tara's bravery and fast action that the selection committee decided that a cat this spectacular should be the National Hero Dog," said the group's president, Madeline Bernstein. 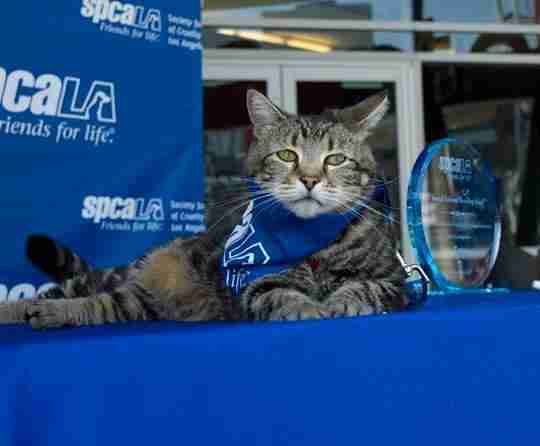 The award looked just as it does every year, except the word "dog" was scratched out and replaced with "cat." Tara made no comments at the award ceremony, but seemed pleased to be honored. And she looked quite striking in her outfit, a blue SPCA bandana.